Constellation Research, Inc. predicts that the global advertising market (paid search, display, and classified) will hit $125B by 2015. While IT budgets continue to stay flat, marketing budgets are up. Warc’s recent Global Marketing Index (GMI) entered positive territory in March 2012. Consequently, the heat up in marketing and advertising market attracts not only start-ups, but also tech vendors looking to enter this lucrative market. In just less than 28 months, enterprise software vendors have bolstered their presence with Chief Marketing Officers mostly through acquisitions and partnerships. The goal – capture budgets allocated for digital creation, marketing automation and revenue optimization, advertising, CRM and customer experience, analytics, and information brokering (see Figure 1). Why the change? Marketing sits at the cross roads between the old analog world and the new shift to digital transformation. With each big shift, organizations will change what technologies they invest in, who they decide to partner with, and how quickly they will make the shift. 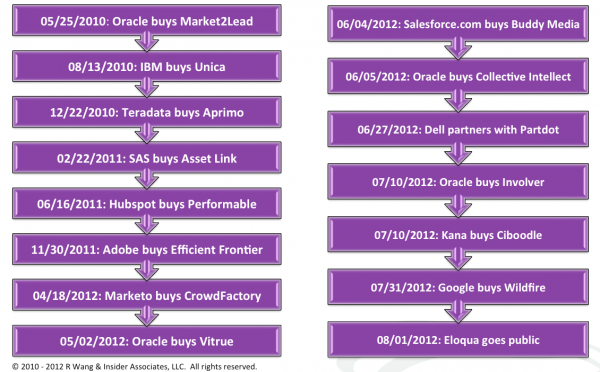 This new battle for CMO mind share started when IBM purchased Unica for $480M in August 13, 2010 (Figure 2). 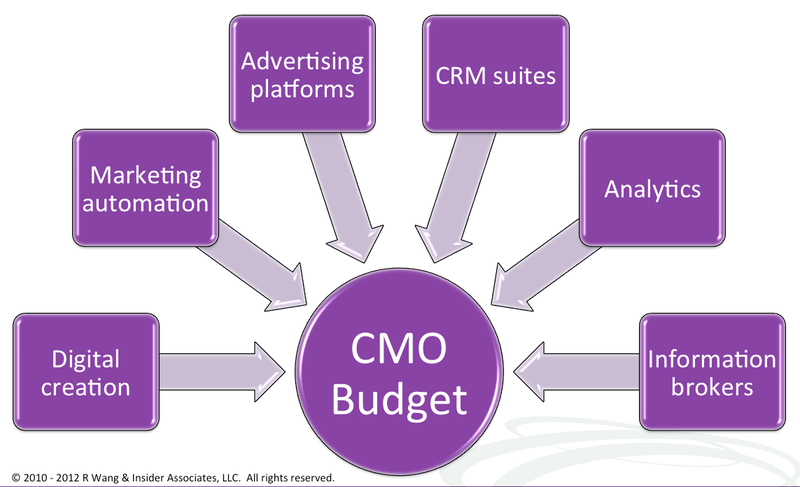 The frenzied activity by Adobe, Dell, Eloqua, Google, Hubspot, Kana, Marketo, Oracle, Salesforce.com, and SAS Institute reflect the desire to be top of mind among CMO budgets. Digital transformation is no longer a nice to have in the halls of the CMO. In fact, today’s CMO will complete the shift from analog to digital in the next three to five years. This shift corresponds to a shift from transactions to engagement. In the design of new engagement strategies, CMO’s will rely more on digital models. While analog will not go away, CMO’s expect to embed digital components into analog models for not only tracking, but also improved outcomes. CMO’s get tech savvy. The consumerization of IT is among us. Business leaders such as CMO’s must get up to speed on how disruptive technologies will transform their business and their business models. The shift to digital transformation requires the adoption of new competencies in addition to the existing marketing skill sets. CMO’s will need trusted advisers who understand their requirements. Meanwhile, CIOs must design policies and procedures to support the extension of CoIT to new leaders. Tech emerges as a core competency in agencies. Vendors need access to the marketing decision makers. Today, agencies own the trusted relationships that solution providers need for access. Technology vendors will partner up with agencies in a similar fashion as system integrators. System integrators will partner with agencies. System integrators will tie up with agencies to provide the tech skills the agencies lack. In many cases, marketing outsourcing and marketing process outsourcing will emerge. System integrators will also get into big data outsourcing by brokering information into subscriptions that marketers and agencies will consume.